End the internet as we know it by destroying Net Neutrality protections. Let Trump’s favorite media empire Sinclair (known for its record of racist coverage and anti-Muslim "must-run" broadcasts) get even more reach and power. Shut off phone and internet service for people who are struggling. Not a single senator should support that agenda. The Senate needs to stand up for what's right and fire FCC Chairman Ajit Pai. Vote against Ajit Pai's reappointment to the FCC. We are so done with Trump's FCC chairman, Ajit Pai. To be fair, we were done with him years ago. Since he joined the Commission, he's worked to undo policies designed to protect internet users, communities of color and poor people. While he's supposed to protect the public interest, he's continuously voted against it and sided with the deep-pocketed corporations — like Verizon — that once employed him. He's failing at his job. And that means we need the Senate to fire him. And we have an opportunity. The Senate has to vote to reconfirm Pai by the end of the year or he's out. Here's what that means for us: We can get every single member of the Senate on the record about Net Neutrality and a whole lot more. End the internet as we know it. Let Trump's favorite media empire Sinclair (known for its record of racist coverage and anti-Muslim "must-run" broadcasts1) get even more reach and power. 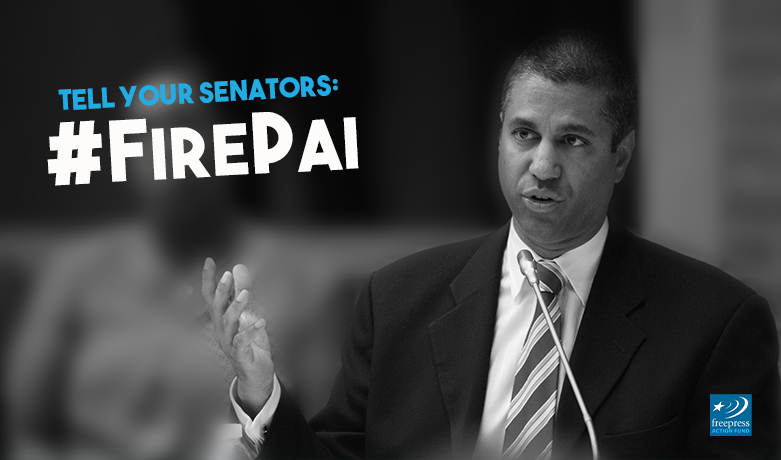 The Senate needs to stand up for what's right and fire FCC Chairman Ajit Pai.